The health and wellbeing of young people need specific attention from policy-makers. While an integrated and holistic approach is the way forward, a life course approach recognizing the specific characteristics and needs of every stage in life is needed. Addressing the needs, priorities and risk factors of the youth in a realistic manner, while taking into account differences related to age, gender, sexuality, disability, ethnical and cultural backgrounds, makes social and economic sense for now and for the future. The whole thing can be downloaded here. The master of global public health data visualisation, Hans Rosling, is one of the people I follow on Twitter. Today he pointed to a tool developed on the website for the Institute for Health Metrics and Evaluation which looks at the causes and risks of amongst other things death and years of life lost. As you might expect the data is at a regional level, but you can break it down by age group. So I’ve been looking at what it has to say about teens in Western Europe. The European Union are thinking about the next drug strategy. This will set some of the international context in which our work will happen and that of the UK governments strategies as they develop. In the field of drug demand reduction, the objective of the EU Drugs Strategy 2013-2020 is to contribute to the measurable reduction of the use of illicit drugs, to delay the age of onset, to prevent and reduce problem drug use, drug dependence and drug-related health and social risks and harms through an integrated, multidisciplinary and evidence-based approach, and by promoting and safeguarding coherence between health, social and justice policies. We wanted to retain the existing recognition of drug policy as a national competence whilst enabling EU investment and coordination where it can genuinely add value – for example in developing capabilities in third countries that directly impact on the availability of drugs in the UK and encouraging further research and information sharing to enable a rapid national response to emerging threats such as new psychoactive substances. Paul and I spent two days in Krakow last week at the European Society for Prevention Research (EUSPR). As with the two previous conferences that the society has held the agenda was packed and there’s a lot to digest. The theme of this year’s meeting was the common risk and protective factors for multiple risk behaviours and saw speakers from both Europe and North America try to make sense of some quite complex data. For example, Judith Prochaska from Stanford University took us through a lot of US attempts to work out how to affect a number of interrelated risks – cancer, substance misuse, obesity, and diet – and seemed to conclude that not only do you need to think about the risks you’re trying to effect, but the combination of interventions you use, and the order in which you run them. So for example if you’re trying to work on smoking with those trying to treat their drug use, then waiting for a couple of weeks before doing smoking cessation seems critical to better outcomes. Dr Dan Hale from UCL presented an analysis that he has been involved in looking the common factors that are associated with a range of risk behaviours. He said that substance use, sexual health and violence are partially explicable due to common risk but associations decrease with age – these include bullying and poor school attachment. The exception being alcohol misuse where they found that the predictors for heavy drinking at age 19 are getting on well at school and having good grades – which he thought could be to do with the norms around university’s drinking cultures. Another of the keynote speakers was Fabrizio Faggiano, who argued that we need to think about putting in place a regulatory system for prevention interventions, similar to the ones that regulate medicines. He suggested that too often when prevention interventions are proven to be ineffective we think it is okay to tinker with the content, but in his view if an intervention is showing an iatrogenic effect (making things worse), we should decommission it. As well as being able to draw on the expertise of the keynote speakers we were able to present the work we did with Street Talk both as a poster (right) and during one of the parallel sessions. Both were very well received. Of particular interest was the use we made of an ‘app’ for smart phones and tablets to help our practitioners screen and gather data from the 2,000 young people who were seen during the project. I was also pleased that there was an appetite to try to replicate the Street Talk approach from researchers in a number of countries. I will be making another presentation on Street Talk at a meeting of experts in brief interventions with young people at the EMCDDA in Lisbon in January. Another excellent presentation by Nik Koutakis explained how the Effekt programme, which offers a brief intervention with parents which has led to reductions in drunkenness by their teenage children, worked and how it had been brought to scale in Sweden. Judy Hutchings from Bangor University explained how she had researched and then introduced the Incredible Years programme to Wales. Judy was clear about the amount of work that she’d done to ensure that the programme was delivered with fidelity and the proper levels of support for practitioners, which she saw as critical to the successes she and her team have been able to measure. Alongside all of the presentations we also held a members meeting – at which I presented a report on behalf of the Supervisory Board – where one of the issues that was discussed was the need to attract more practitioners to become involved in the society. I can see huge benefits in this, both to practitioners but also to the research community. The image above is taken from the by The Prime Minister’s Office Flickr Stream and gives some context to what is to follow. The World Health Organisation have produced alcohol profiles for countries in the region. As you’ll see they’re focused on adult drinking, but hold some interesting data. an additional 1.2 litres of pure alcohol per person than the average European – and as that includes Russia and other Eastern European countries I suspect the average would be considerably lower if we were to just look at Western Europe. If I’ve done my maths right* that means that this means that every one over the age of 16 drinks 42.2 pints of larger (5% abv) more than our continental cousins over the course of a year. There are about 49,619,840 of us over the age of 16. So that’s 2,093,957,248 extra pints as a nation. Or, if you’re more of a wine person that’s the equivalent of 610,324,032 extra bottles of wine. There are also some interesting difference between men and women. Men who drink are putting away an average of 21.58 litres of pure alcohol a head per year (or if you’d rather 999 pints of pale ale (3.8% abv)), while women drinkers are much more abstemious drinking 9.46 litres (or 860 bottles of alcopops (4% abv)) over the course of a year. 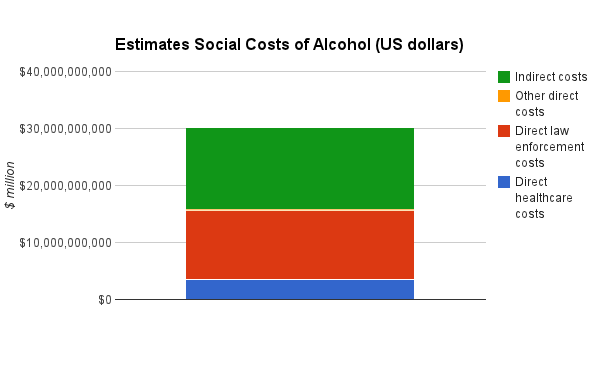 Another interesting part of the briefing is the estimated social costs of alcohol – from which they’ve excluded Northern Ireland for some reason. They calculate the figures in US dollars and I’ve taken a conversion rate of $1 to £0.6237. WHO say that the total social costs that we bear as a result of our alcohol consumption comes out at about $32 bn (which comes to about £20 bn). They break this down a little so we see that about $3.5 bn (£2.2 bn) of the total comes from the health budget, and $12.2 bn (£7.6 bn) being spent in criminal justice expenditure. The rest comes from what they call direct and indirect costs – unfortunately they don’t seem to define what those costs might be. It’s always interesting to see comparative data, and this project is looking at urban health across 26 European cities – 5 of which are British. 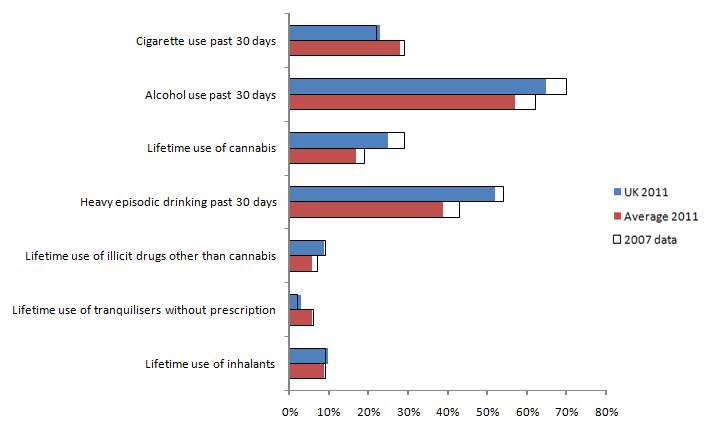 I’ve extracted the data that relates to smoking drinking and drug use and as you’ll see there are some considerable differences. Perhaps most obviously Merseyside and Greater Manchester teenagers are far more likely to have engaged in heavy drinking that either the other British cities or the European average, and it is those two cities that also lead on the proportion of young people who first drunk at or under the age of 13 years. I’m also struck by the fact that youth in all the British cities were above the average when it comes to ever having used cannabis – the difference ranges from 2 to 8%. More positively daily smoking is considerably lower than the EU average in 4 of the 5 cities. We are keen to ensure that the next iteration of the EU drugs strategy maintains its balanced approach, encompassing public health approaches and enforcement measures, working together to reduce demand and restrict supply. It is important that there is a clear and consistent approach to prevent drug use and minimise drug misuse, and that there is a strong focus on moving individuals with a dependency into sustainable recovery. The EMCDDA have just published a shedload of data about drugs in Europe. The Statistical bulletin is published yearly by the EMCDDA and consists of over 400 tables and 100 graphs of the most recent available data on the drug situation in Europe, all available to view interactively on screen and download in Excel format. I’ve picked through it so that you don’t have to and pulled together this presentation. On many of the graphs I’ve not put in all the countries where there is data, so for example with the slides about the use of the law I’ve only put on countries at the top end of the scale, where the UK has the fourth highest rates of offences for possession and the third for supply. The findings of the 2011 ESPAD survey of 15-16 year olds has just been published, covering 36 countries . Unfortunately, since only six schools in the UK completed the survey, the authors warn that it is not possible to draw firm conclusions about trends among the UK’s young people. 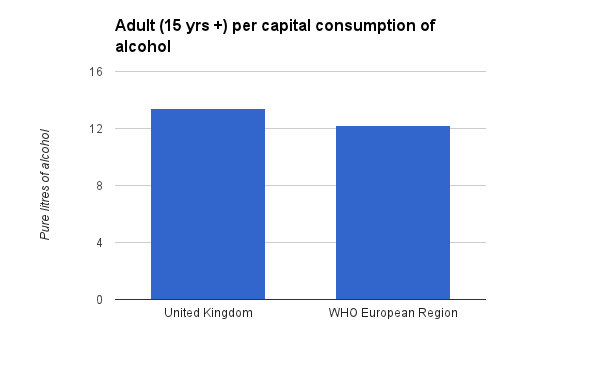 However, comparing the data to 2007, as in the graph below, shows that 2011’s results are not dramatically different: our teenagers are drinking more than the European average, smoking less, and are slightly more likely to use cannabis.